"Earlier today, Amazon made its long-rumored screen-based Echo device official. The Echo Show is basically a cuboid Echo with a touchscreen and camera attached to it. It supports all of the far-field voice commands as the original, so you can use it to play music, control smart home gadgets, add items to a shopping list, check the weather, and do thousands of other things. The new screen provides a way for the Show to display its answers in addition to speaking them aloud. It will display cards for the weather, products to buy on Amazon, videos on YouTube, and whatever else developers think of. But what’s most interesting to me is its ability to be used as a calling device, or, in more traditional terms, a video phone. Along with the Echo Show, Amazon is launching a new communications platform for Alexa devices, which allows for calling and messaging between Echo units and smartphones that have the Alexa app installed. A feature called Drop In lets the devices connect instantly, without requiring someone to “answer” the call. 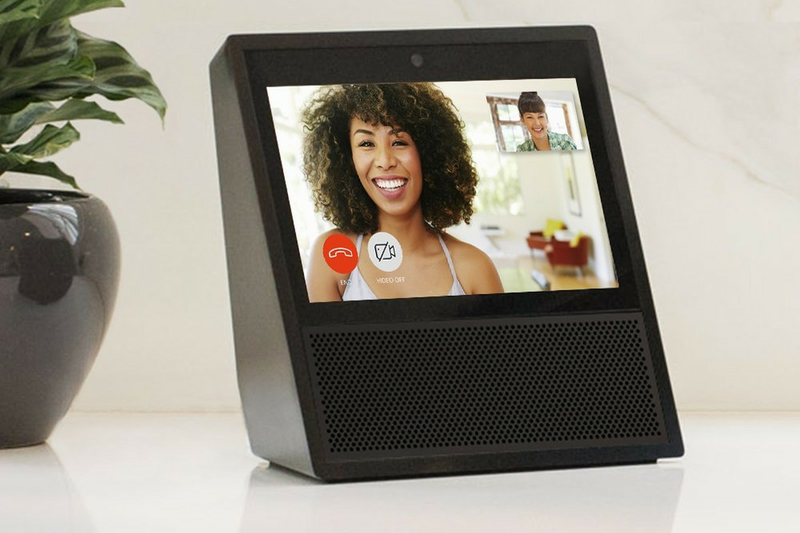 This allows the Echo Show to be an always-ready, internet-connected video intercom that I can call from anywhere in the world using my smartphone."